Sickening eggs and lettuce? Didn’t we pass a major law to fix food safety? After fading from the headlines in 2015-16 when a major restaurant chain struggled with meals that sickened dozens in multiple states, big worries have erupted anew about the safety of the nation’s food. That’s because federal officials and a supersized-farmer are struggling with salmonella outbreaks tied to more than 200 million now-recalled eggs, even as growers, grocers, and eateries wrestle with dozens of E. coli illnesses linked to romaine lettuce. The worrisome poultry products came from Rose Acre Farms’ North Carolina operation, which produces 2.3 million eggs a day from 3 million hens. Its products go to stores and restaurants in Colorado, Florida, New Jersey, Pennsylvania, Virginia, West Virginia, and the Carolinas, the Washington Post reported. Those eggs have been blamed for Salmonella braenderup infections that have sickened 23 people from nine states. No deaths have been reported. Rose Acres, which has 17 facilities in eight states, has acted with “an abundance of caution,” federal officials noted, and recalled more than 200 million eggs, sold under the brand names Great Value, Country Daybreak, and Crystal Farms. Waffle House restaurants and Food Lion stores also were sold the potentially bad egg. The Wall Street Journal reported that Rose Acres’ Carolina facility experienced problems maintaining sanitary conditions, including dealing with rodent control. Meantime, the federal Centers for Disease Control and Prevention reported that dozens of people in 16 states have been sickened, likely by romaine lettuce grown in the Yuma, Ariz., area, and possibly contaminated with E. coli O157:H7. Again, no deaths have been reported, but more than 30 cases have been sufficiently severe to require hospitalization. Health officials have sought to provide extensive information about both potentially tainted eggs and romaine, urging consumers to inquire with grocers and restaurants about food sourcing and to avoid buying or eating problem products, and tossing anything suspicious. 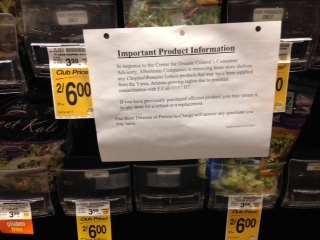 Groceries, as a result, have sprouted warning signs and empty produce cases (as shown in photo above). Federal officials initially urged customers to avoid chopped and packaged romaine, then they slowly have widened that warning. Pennsylvania was home to 12 people infected … more than any other state. Idaho was next, with 10 recorded illnesses. The other states involved were Alaska, Arizona, California, Connecticut, Illinois, Louisiana, Michigan, Missouri, Montana, New Jersey, New York, Ohio, Virginia and Washington. The agency estimates Salmonella causes about 1.2 million illnesses, 23,000 hospitalizations, and 450 deaths in the United States every year, with food the source for 1 million of these illnesses. Those infected develop diarrhea, fever, and abdominal cramps. The illness usually lasts 4 to 7 days, and most people recover without treatment. The diarrhea may be so severe that patients must be hospitalized. As for E. coli, its shiga toxin-producing variant is most commonly associated with illnesses, with the nation recording 265,000 so-called STEC infections each year. Many of the infected do not need nor seek medical care. They suffer severe stomach cramps, diarrhea (often bloody), and vomiting. Some people may have a mild fever, and most infections ease after 5 to 7 days. Although many cases may be mild, others can be severe or even life-threatening. In my practice, I see the significant harm that patients suffer while seeking medical services, and I know it may be best for most of us just to stay so healthy we keep away from doctors and hospitals. It’s our collective nightmare to take every precaution to stay well, only to be felled by illnesses borne by common, every day foods like eggs and lettuce, or in fast-food meals, as occurred in a notorious, recent outbreak. It’s unhappy news that the nation’s seeing food outbreaks of this size and scope, especially because it’s only April. Many such incidents often occur in warmer days due to issues handling and storing food properly, whether by individuals and families or at paid establishments. Restaurants, in particular, should mind their p’s and q’s with food safety, though they often don’t. It ends up costing them, with researchers estimating that a fine dining spot could be hit with costs exceeding $2 million due to food borne illness cases. For the public’s sake, it’s disappointing that the much publicized Food Safety Modernization Act signed into law by President Obama in 2011 and promoted as a major federal effort to safeguard what we eat, may not be doing all it needs to, especially as Big Food consolidates companies in the sector to fewer and fewer supersized outfits. Those with doubts as to whether food safety is improving can just look at tallies of major investigated incidents in recent years, roughly more than 20 of them annually. Meantime, the Federal Food and Drug Administration already has been criticized by watchdogs for dawdling in its crucial role of clearing shelves of tainted foodstuffs. Congress may need to put a poker to some backsides at FDA – before we have even worse and deadly outbreaks of food-caused sicknesses. The warnings from these latest egg and lettuce incidents are sounding, who will heed them?